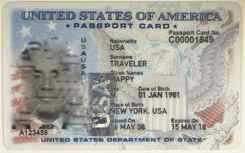 The U.S. Passport Card -- What Is That? Can You Use It Instead Of A Passport? 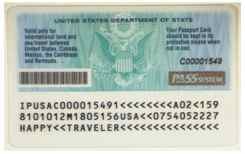 The United States only began issuing the U.S. Passport Card in July of 2008. So just exactly what is it and when can you use it? What Does A Passport Card Look Like? Also when it was issued and when it expires and the card number. The back has a bar code and your information. There is a also computer chip embedded in the card. ...but they will be able to access your passport photo and "biographical" information which is stored in a secure government database. The cost is less than for a U.S. Passport. For more details go the the US State Dept page on them. ... only cruising or driving. The U.S. Passport Card CANNOT be used for flying into these counties or any other countries. Sorry for shouting, but you need to know this. You can apply for a card even if you already have a passport. You can also apply for both at the same time if it is your first time to get a passport. If you drive across neighboring borders often, it may be more convenient for you. Remember, you CANNOT use it for international travel by air to any of these destinations. I know I'm shouting again, but I wanted you to be sure to remember that. We only have our passports now, that takes card of all of our needs, but depending on how you travel, the U.S. Passport Card could be for you.